Background: Melatonin is an endogen substance with several physiological functions, acting as an important antioxidant. Our objective was to prepare nanoparticles composed of poly(lactic-coglycolic acid) (PLGA) coated with polysorbate 80 (PLGA-PS80) or uncoated (PLGA) nanoparticles containing melatonin (MLT) and evaluate their in vitro cytotoxicity over erythrocytes and in vitro antioxidant activity. Methods: Nanoparticles were obtained by an emulsion-solvent evaporation method and characterized by size, morphology, polydispersity index, zeta potential, encapsulation efficiency, thermal properties and in vitro drug release profile. The in vitro cytotoxicity over erythrocytes was assessed by hemolysis assay and in vitro antioxidant was carried out by colorimetric assay using the radical 2,2-azinobis (3- ethylbenzothiazoline-6-sulfonic acid) diammonium salt) (ABTS·+). Results: Mean size of the PLGA-PS80 and PLGA nanoparticles was 212 and 187 nm, and the encapsulation efficiency of MLT was 26 and 41%, respectively. Nanoparticles were spherical in shape and presented negative zeta potential. 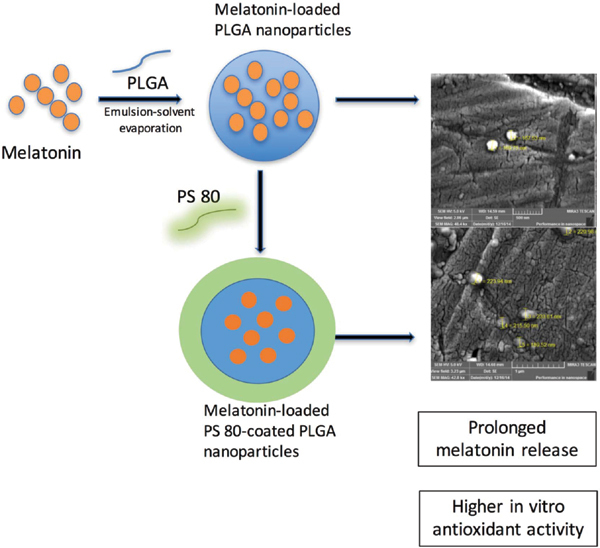 MLT was released from nanoparticles following the second order model and PLGA-PS80 presented more prolonged MLT release. Conclusion: Cytotoxicity over erythrocytes was assessed and both nanoparticles containing MLT demonstrated lack of hemolysis. Scavenging activity over ABTS·+ demonstrated both nanoparticles containing MLT were more efficient than free drug, and MLT-loaded PLGA nanoparticles presented the higher in vitro antioxidant activity. The study concluded that PLGA and PLGA-PS80 nanoparticles are promising carriers for MLT. Keywords: Antioxidant, cytotoxicity, hemolysis, melatonin, nanoparticles, PLGA. Keywords:Antioxidant, cytotoxicity, hemolysis, melatonin, nanoparticles, PLGA. Abstract:Background: Melatonin is an endogen substance with several physiological functions, acting as an important antioxidant. Our objective was to prepare nanoparticles composed of poly(lactic-coglycolic acid) (PLGA) coated with polysorbate 80 (PLGA-PS80) or uncoated (PLGA) nanoparticles containing melatonin (MLT) and evaluate their in vitro cytotoxicity over erythrocytes and in vitro antioxidant activity.